Our special 13-day Combination Safari will have you hunting in Central Arnhem Land Mann River as well as in the very unique Murgenella Floodplains of Western Arnhem Land. 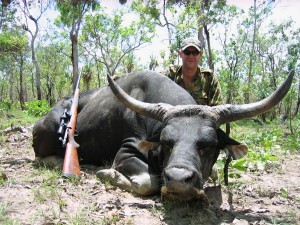 You can hunt trophy buffalo, wild oxen (scrub bulls), trophy banteng and boars. The banteng (Bos javanicus) is a species of wild cattle found in Southeast Asia that was first introduced to Australia in 1849 with the establishment of a British military outpost called Port Essington on the Cobourg Peninsula. The population has not strayed far from its initial point of domesticated life; all currently live within the Garig Gunak Barlu National Park to the north-western Murgenella Floodplains area where they are found primarily within the monsoon forests, woodland areas, springs and grasslands. 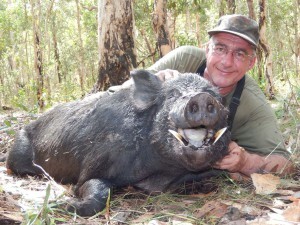 Tropical Hunting Safaris specialise in personalised hunting for both experienced and novice hunters in the very unique Murgenella Floodplains of Western Arnhem Land. We can cater for parties of up to six hunters. 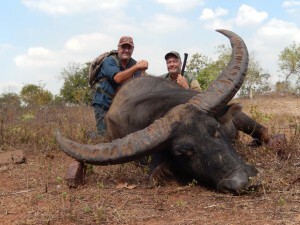 Safaris are tailored to suit your needs and requirements. Our specialty 7-day package includes all meals, beverages, insurances, trophy fees, ATV’s and accommodation. Water buffalo (Bubalus Bubalis), while they are plentiful in numbers, the trick is finding an animal that is considered to be of ‘trophy’ standard. A trophy bull water buffalo will weigh in at between 700kg up to well over 1000kg, stand 1.5+ metres at the shoulder and will boast a set of horns with well over a 1-metre spread. These big animals have a keen sense of smell, perfectly good eyesight, acute hearing and, while they are not gun shy, they are very much in tune with their local surroundings. Spook them and they will run forever; annoy them and you had better have your wits about you. 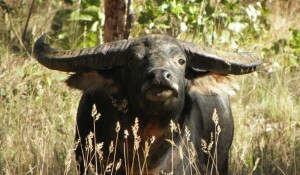 Having 1000kg of very annoyed water buffalo bearing down on you will certainly get your attention!